It is the goal of the Washington Unified School District that every student is given access to an excellent educational experience, every day. In an effort to define for our parents, staff, and students exactly what our students will achieve, Washington Unified’s leadership developed the Core 6, and has been working to ensure that it becomes a reality for all students. 1. Students will experience positive relationships. 2. Students will use a standards based curriculum. 3. Students will engage in collaboration, communication, critical thinking, and creating evidence of mastery. 4. Students will read and produce writing. 5. Students will use technology. 6. EL students will receive differentiation. First, students will experience positive relationships. It is the belief of the Washington Unified School District that students will thrive in safe supportive environments. Every staff member is committed to maintaining positive relationships with students and their families. 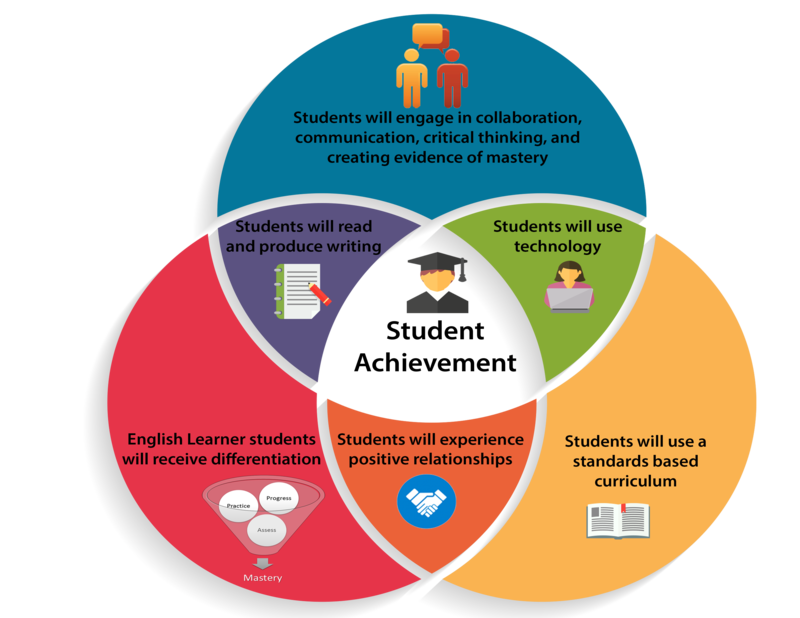 It is also imperative that students use a standards based curriculum and that students will engage in collaboration, communication, critical thinking, and creating evidence of mastery. These 21st century skills will prepare our students to achieve their goals of college and career. WUSD is committed to ensuring that students will read and produce writing and that students will use technology so that they will thrive in today’s global society. Site literacy and technology initiatives are helping to ensure that all WUSD students can read at grade level and write clearly and effectively. Finally, in all of our schools, EL students will receive differentiation to ensure that every student is successful. By defining the Core 6, WUSD hopes to promote a strong focus in these areas so that students will be prepared for college and career. Teachers receive on-going training in select Core 6 areas. Teachers are provided with research based curriculum and tools so that every student is prepared to master rigorous grade level standards. Reading and writing instruction is ongoing and the District is proud to have increased student technology tools at every site this year. Washington Unified is committed to the success of every child and believes in ensuring that their educational experience is positive and prepares them for their futures.